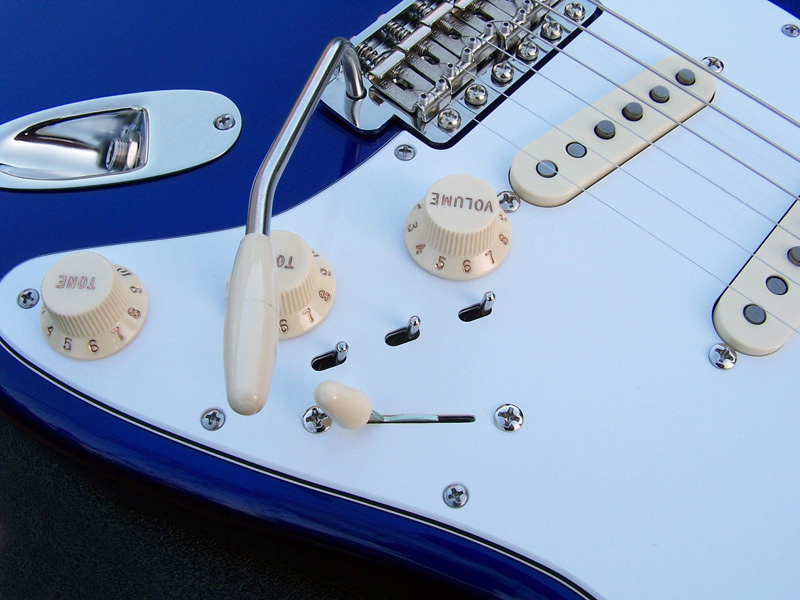 Another one of our own custom built Strat's® that offers a total of 22 different pickup selections via 3 uniquely recessed mini-toggle switches. 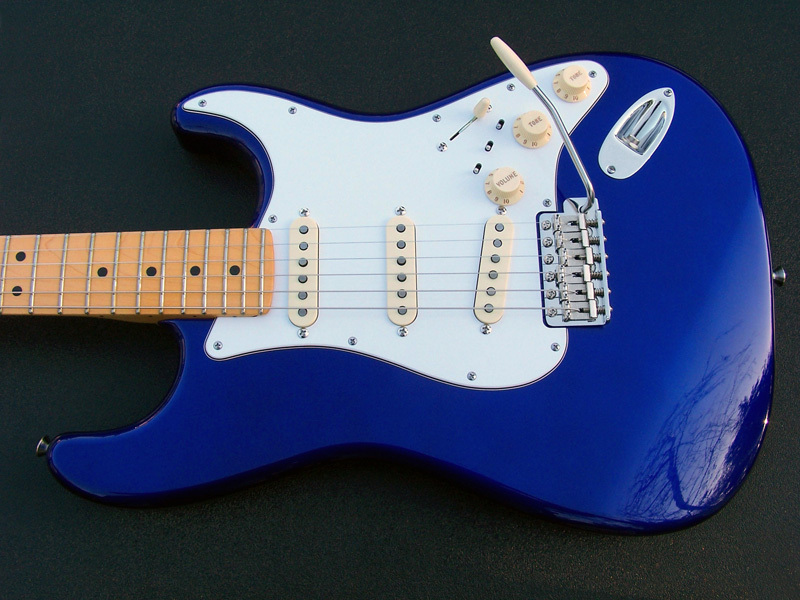 Classic Strat® tone as it's loaded with top quality Seymour Duncan pickups throughout. 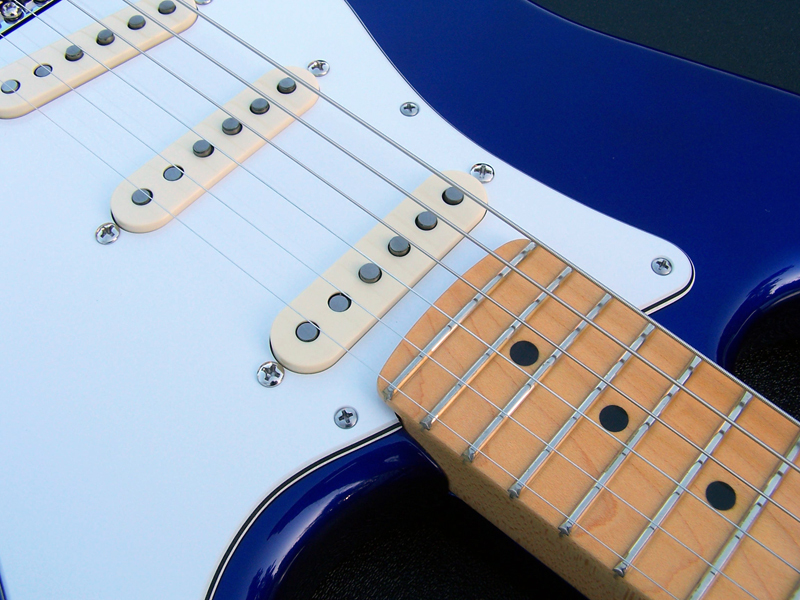 From a screaming hot tapped bridge pickup to true vintage middle and neck pickups. Pickup Mod Switch 1: A SPDT mini-toggle switch toggles between the tapped portion of Seymour Duncan SSL-5T bridge pickup or full output. Switch position up gives you full pickup output, switch position down is the tapped portion of the pickup winding or lower output level. Pickup Mod Switch 2: A SPDT mini-toggle switch toggles on or off the neck pickup no matter what position the 5-way pickup selector switch is in. This mod gives you two more pickup selection options from the standard 5. 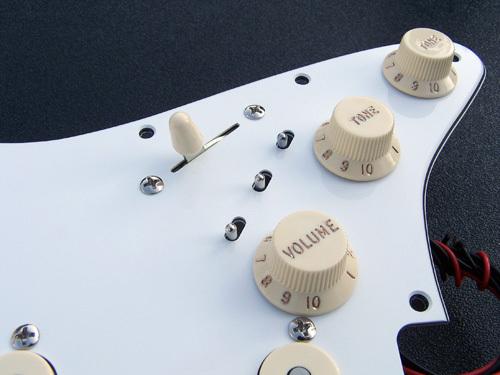 Same as our Gilmour Black Strat® modification. Pickup Mod Switch 3: "Direct Through Mod". 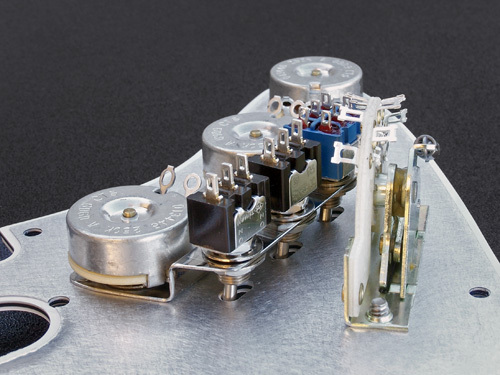 A DPDT mini-toggle switch. 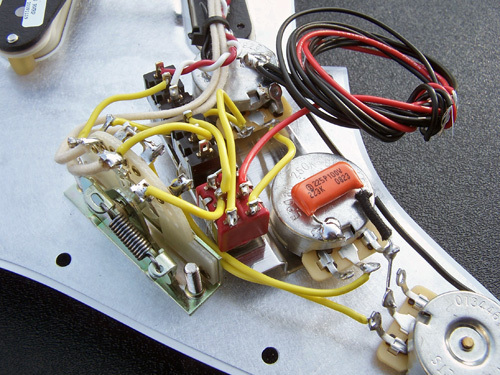 With this switch activated the output from the pickups is passed directly to the output jack bypassing the volume and tone potentiometers and eliminating any of their signal attenuation. 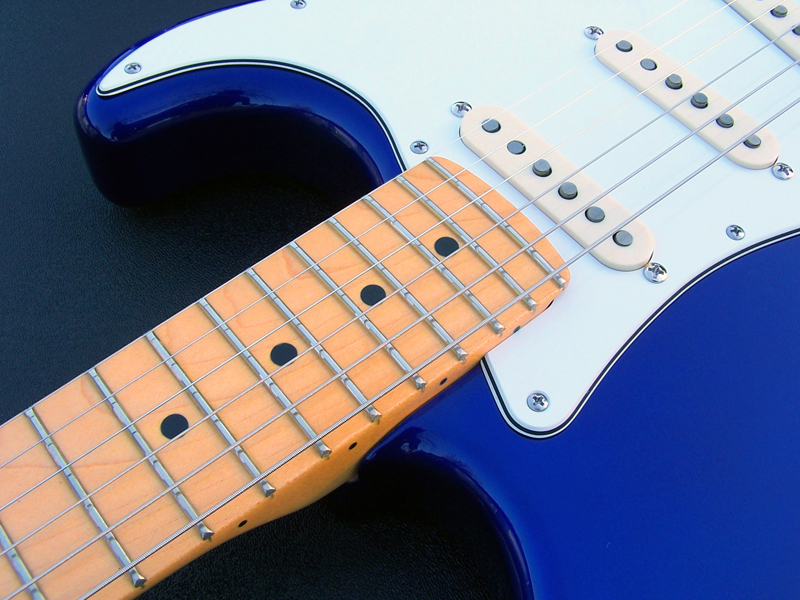 Allows the full flavor, output and character of the pickup to be sent to your amp. 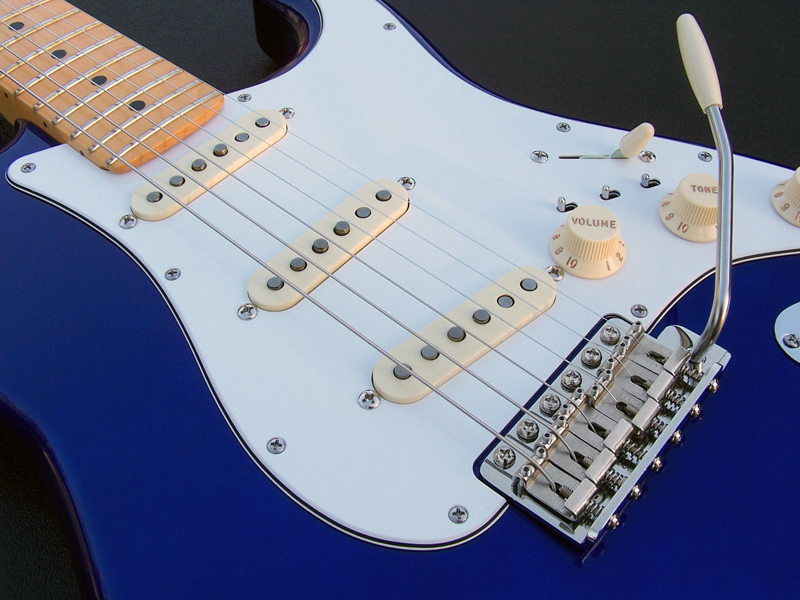 Bridge: Seymour Duncan SSL-5T (Tapped for dual output option). Middle: Seymour Duncan SSL-1 Rw/Rp (Reverse wound/reverse polarity for hum canceling when the 5-way pickup selection switch is in positions 2 and 4. 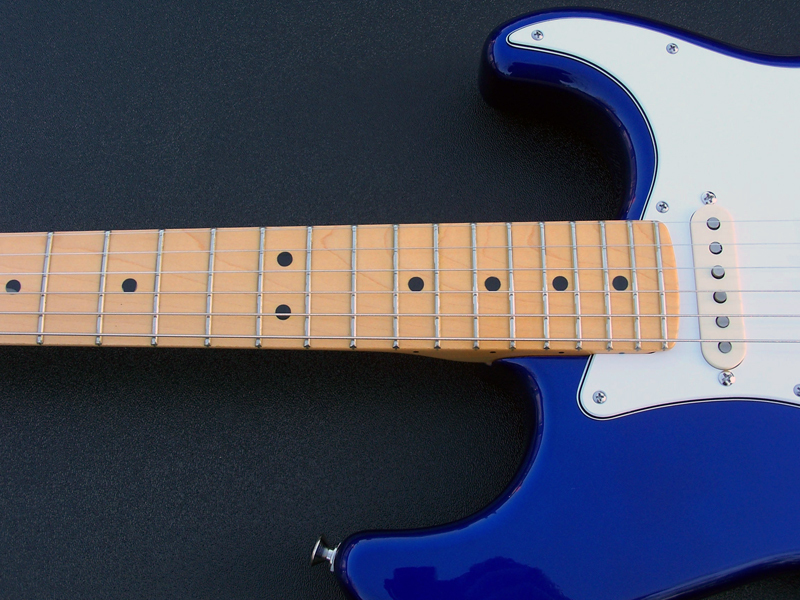 Neck: Fender® USA 22 fret 1999 vintage maple neck that is in superb near mint condition. 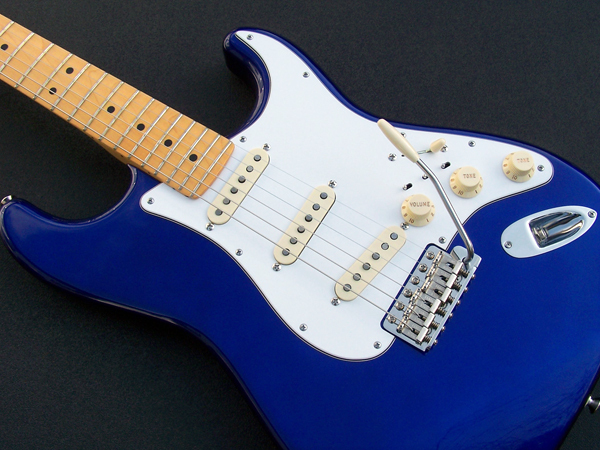 Body: Is a excellent condition 2007 '62 reissue Jupiter blue MIJ Strat® body. 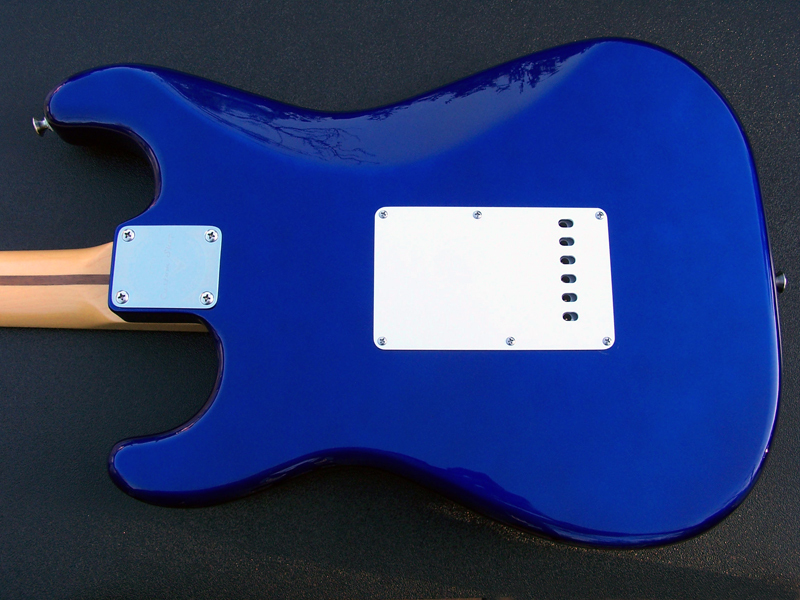 It is a wonderful blue metallic body that looks great with the white pickguard along with the aged white accessories and the maple neck. The colors and tones of entire guitar complement each other nicely. The control cavity of this body has been fully shielded with conductive shielding paint. The metallic paint characteristic of the body does not come through in the photographs for some reason, it basically looks like a solid blue color. The blue color in the photographs looks lighter than it actually is, it has a darker hue to the color. 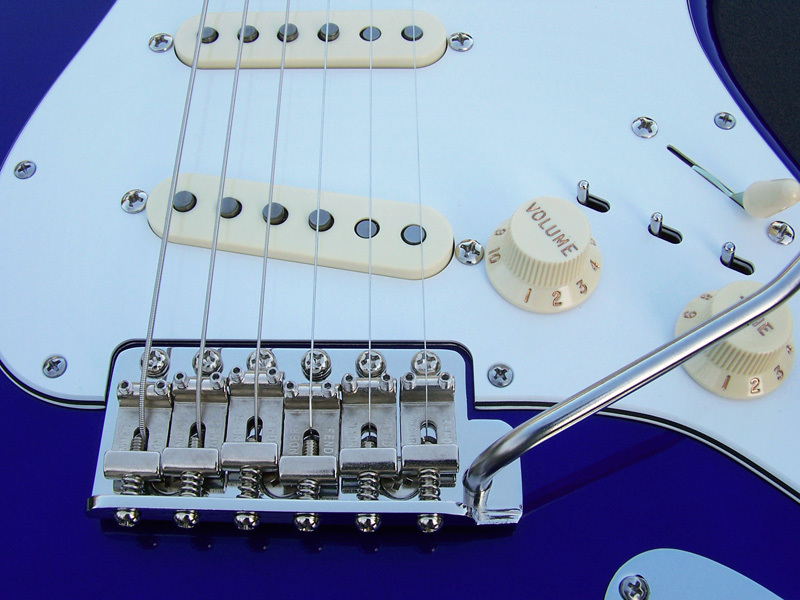 Bridge: Fender® USA '62 re-issue vintage bridge assembly with 2-7/32 string and mounting spacing. 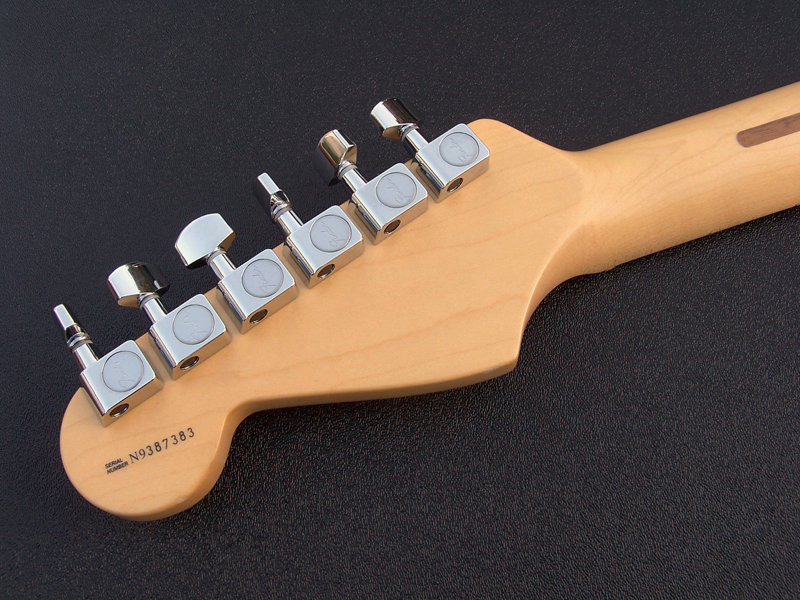 Includes our own custom shop shortened length 4-1/4" stainless steel tremolo arm. 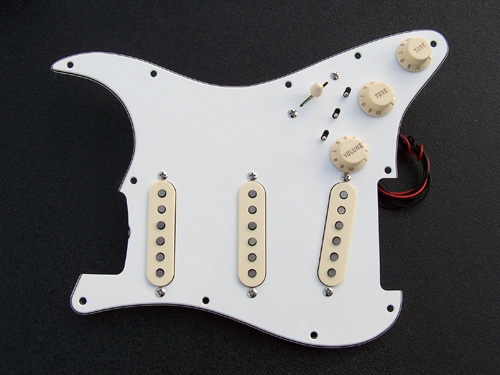 Pickguard: Fender® USA white 3 ply '62 re-issue with an full pickguard coverage aluminum shielding plate. 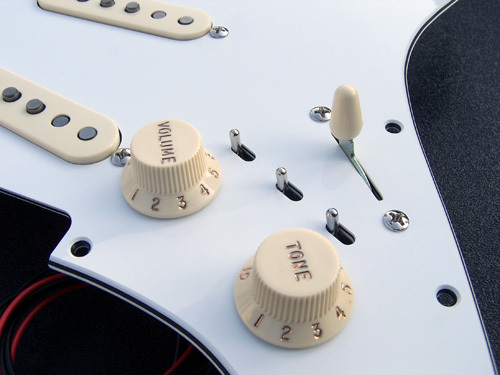 Accessories: Aged white pickup covers, knobs, switch tip, tremolo arm tip and white vintage style tremolo cover. 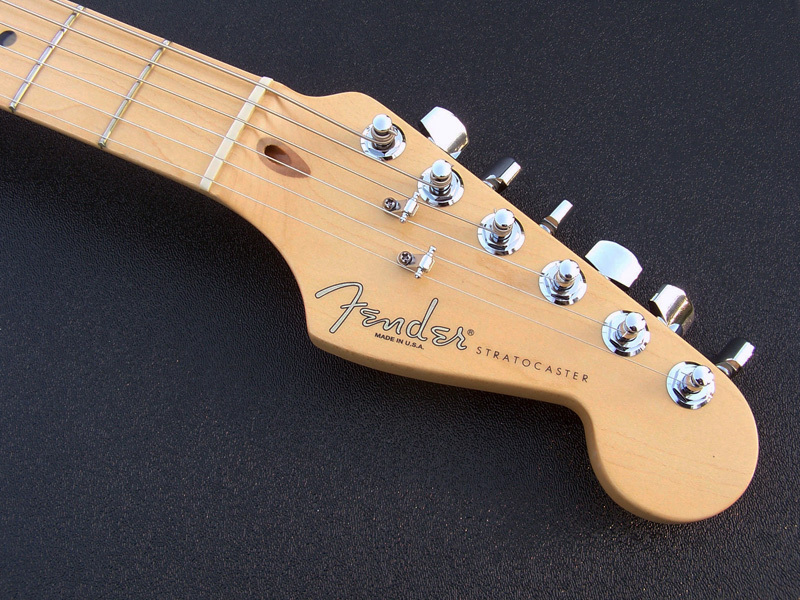 Tuners: Fender® American Standard, Chrome. Electronics: CTS 250k potentiometers, CRL 5-Way pickup selector switch, Sprague Orange Drop 0.022 uF tone capacitor. 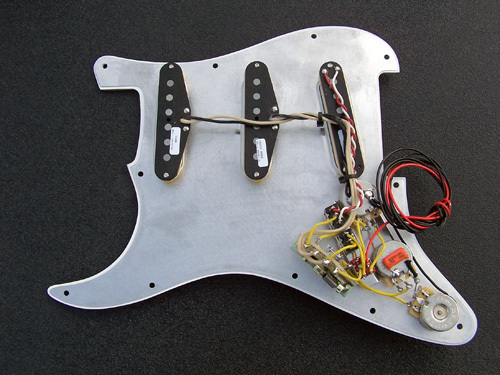 Below are detailed and close-up photographs of the pickguard / electronics assembly in various stages of construction. Images of the triple recessed mini-toggle switch mounting hardware is shown up close and depicts how the three switches are fastened to the back side of the pickguard which allows only a small portion of each of the mini-toggle switch levers to protrude through the top side of the pickguard for that sleek, unobtrusive and unique appearance and presentation.